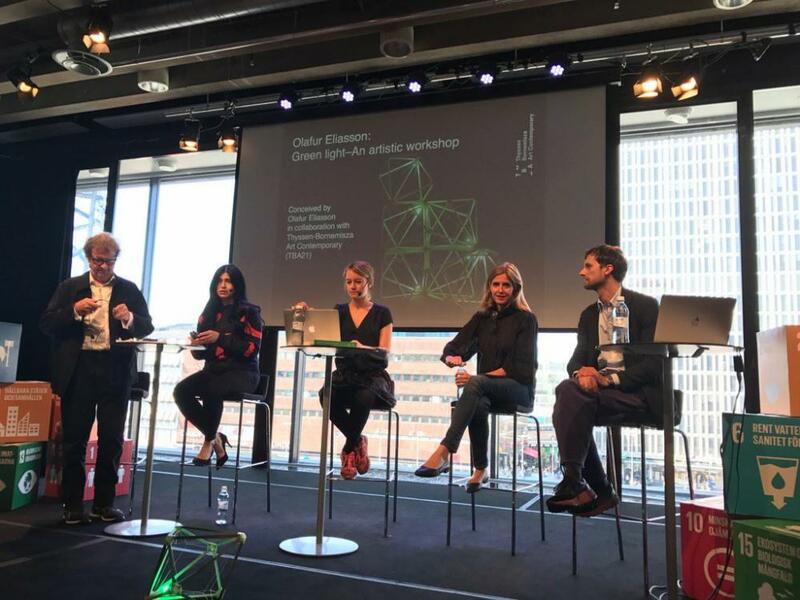 On August 26, 2017, Green light–An artistic workshop was presented in Stockholm, Sweden, in the context of the Stockholm Act – a festival that brings together actors from the fields of science, politics, civil society, business, and culture to collectively raise awareness for the Resilience Program 2030. The latter refers to the UN’s 2030 Agenda for Sustainable Development with a total of 169 targets covering economic, social development, and environmental protection. Green light community member Frederike Sperling, curator of the Shared learning program in Venice, introduced the concept and history of Green light and entered a generative discussion on the political reach and potential of socially-engaged art projects like Green light together with prof. Pierre Guillet de Monthoux, director of Art Initiative at Stockholm School of Economics, Tinni Ernsjöö Rappe, communications manager at Misum, Golara Vahidimer, curator, and Oscar Carlson, art coordinator The Stockholm Act.